Never underestimate the power of mobile messaging. In China, Tencent’s WeChat is starting to threaten Alipay, Alibaba’s payment arm. WeChat has 883 million monthly active users worldwide. The messaging app added a payment function in 2013. Naturally, not all WeChat users use the app for payments. Tencent said its payment business had 600 million monthly active users as of December. Also, its average daily payment volume in December nearly doubled from a year earlier to more than 600 million transactions, the company said. More than 1 million stores now support WeChat, Tencent said. As hundreds of millions of Chinese now use Tencent’s WeChat messaging app as a mobile wallet, the company’s mobile payment market share has more than quadrupled in just two years to 37%, moving closer to market leader Alipay’s 54%. 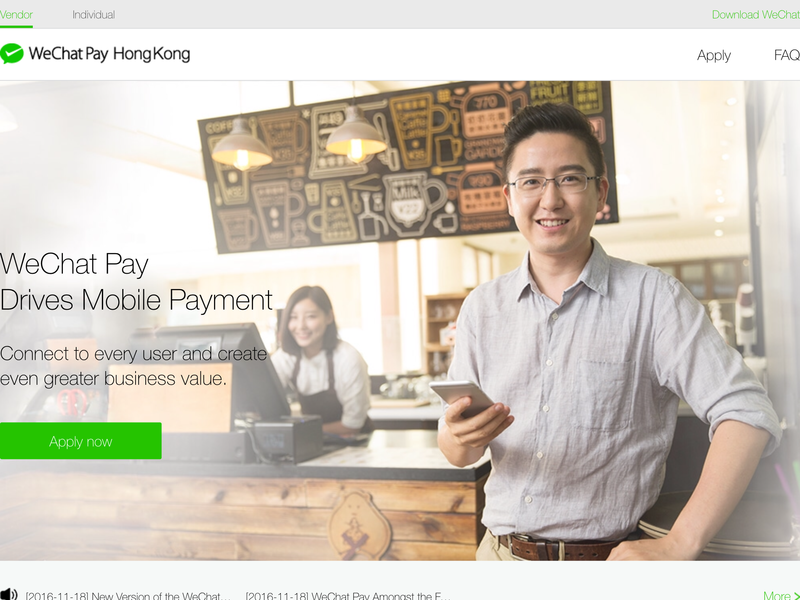 WeChat Pay’s explosive growth could get in the way of Alipay’s attempt to cement its position as an internet finance powerhouse. Indeed, Ant Financial notes that Alipay’s transactions have increased “exponentially” in recent years, especially in offline payments at brick-and-mortar stores. Over 2 million brands in China now accept Alipay as their in-store payment option, the company said. Ant Financial also said its key advantages over competitors include its ability to play major roles in a full range of financial services such as insurance, wealth management and credit assessment. Even so, it’s clear that WeChat Pay is increasingly becoming “the first choice” of many users in online and offline mobile payment scenarios, Analysys said in a report in February. Alipay has a huge advantage still in having more services available and having already more partners on board. But eventually, everyone goes to where the customers are. And they’re in WeChat. Tencent recently invested in Flipkart, which is fighting Amazon and soon Alibaba in India. Alibaba bought a majority stake in India’s Paytm, a payments provider, that Alibaba is going to turn into a kind of Tmall for India with Paytm Mall. WeChat is now focusing more on business-to-business, encouraging Western brands to sell products on the WeChat platform. The service is courting “high-value” brands in countries like the U.K. and Italy, Ghizzoni said in a Bloomberg Television interview. Burberry and Chanel are already high-profile clients on WeChat’s platform. In Europe, the focus is first on fashion and luxury goods, and will in time expand to travel and broader retail services. WeChat is hoping its expansion in Europe will convince more high-profile brands onto the platform, not only to reach consumers in China, but also Chinese tourists visiting Europe. But what makes WeChat strong in China, is missing in those Western markets: users. And it’s not looking like this will change any time soon. Facebook’s Whatsapp and Messenger both have a stronghold on those markets. Facebook Inc., which owns WhatsApp, has been expanding its payments offering within its messaging apps, while Alibaba Group Holding Ltd.’s finance affiliate has been busy pushing Alipay in Europe. In August, Ant Financial, Alipay’s parent, announced a partnership with Ingenico Group SA, a French payments group, to allow Chinese tourists to pay for goods in Europe via the group’s e-wallet platform.